A bag designed for knitters, crocheters, and other fiber artists. We created the Rittenhouse for people who work with yarn. Whether you're a spinner, a crocheter, a knitter, or all three, our bag's got innovative features created with you in mind, and it looks darn good to boot. Years (literally) of design, research, and time behind the sewing machine have gone into this bag. 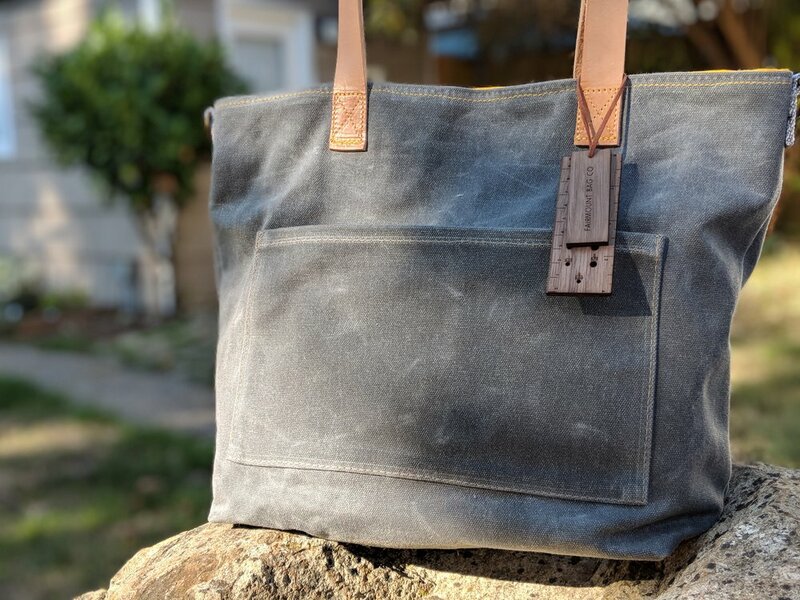 We've interviewed countless crafters, ridden hundreds of miles, and made over a dozen prototypes, passionately crafting the perfect bag design for the modern fiber artisan. The Rittenhouse is the result of this journey. Function? Say hello to form. We believe style and function are two heads of the same coin, and we simply won't compromise on either. The Rittenhouse is not just full of features crafters will love, but it's also painstakingly constructed and carefully designed so that you will love the way it looks and feels as you carry it throughout the day. No matter where you go, the Rittenhouse will effortlessly complement your style. We designed it to look great whether you're on your commute, at the office, or enjoying a day at the park. The capacity is just right for a day on the town, and the materials are guaranteed to turn heads. The Rittenhouse is a bag that's been designed with classic looks and simple elegance. Your yarn will ride in style. Features so clever, you'll think they skipped a grade. Sure, the Rittenhouse is beautiful. But it's also designed to make your life and your craft easier. For starters, we've included a magnetic closure, to keep your yarn safe from snags. We've also added a reinforced scissor pocket, so you have instant access to your scissors without worrying about them poking through the bag. And we've included just the right number of pockets, for holding everything from your smartphone to your circular needles. But our favorite feature would have to be the detachable pattern holder. Need to read your pattern while you work? It flips out and hangs on the outside of the bag. Ready to go? just tuck it back in the bag. It protects your pattern from the wind and rain, and you can even detach it, for when you're traveling light. Quality isn't just a word. It's a passion. With the Rittenhouse, we wanted to create more than just a great bag for fiber artists. We wanted to make a beautiful object that would withstand everything life has to throw at it. Something that would be with you for years, by your side for every adventure. We spent a lot of time finding the perfect materials for this bag. Our waxed canvas exterior has been selected for its quality, reputation, and integrity. This meticulously woven, water-resistant fabric will only increase in beauty and character as it ages. The densely woven interior canvas was selected to withstand the pokes and prods of everyday life. We even selected the color to enhance visibility inside the bag. The straps on the Rittenhouse are made of thick, beautiful, vegetable-tanned leather. Much like the waxed canvas outer, they start out stiff and gradually become more supple and "broken-in" as the bag is used. They will eventually adapt to your hands through daily use, and soon become soft and fit your hand exceedingly well. We finish the bag off with metal accents, including d-rings, snaps, and zippers - not only for an added touch of elegance, but also to ensure durability. Finally, to put put everything together, we use UV-resistant bonded thread that is noted for its incredible strength. This construction ensures that your bag will be with you for years to come. the Fairmount Bag Co. newsletter!